I have always liked to shake things up…in a good way, of course. I like to shake up my exercise routines, yoga postures, culinary experiments, research interests, projects, etc, etc. I also like to feel good and smile a lot. So when I learned of the benefits of shakin’ it up, I knew it was for me. But it is not just for me, it is for every ‘body’—all sizes, shapes, ages, and mindsets. By simply shaking, you stimulate the cells in your body, creating the feeling that “every little cell in our body is happy… every little cell in our body is well!” Shaking gets the energy flowing and awakens the body and mind. In fact, Ayurveda, which is considered a sister science to Yoga, will often prescribe shaking your body when you don’t feel well as the first step in the treatment of sickness. Shaking can be used for healing in place of other forms of medicine. It is a healthy, fun, and a natural way to assist in your own health. Through intentional shaking, you increase not only circulation of blood, but also circulation of prana (chi, air, energy)—the universal life force that enlivens and connects all of life. When prana is increased through the body, many positive effects are experienced. The body begins to use cells more efficiently and stimulates healing and happiness. With the increase of prana flowing through the body, the result can be euphoric. Shaking is a natural way to feel better and increase levels of optimism. Shaking can also increase levels of the molecule known as oxytocin. Oxytocin is referred to by many names, including the “trust hormone,” the “love hormone,” or the “magical molecule.” This molecule has an extensive list of benefits for the body and mind. It is increasingly being seen as a brain chemical that does a lot more than just bring people closer together. Research has been shown to suggest that “oxytocin plays a crucial part in enabling us to not just forge and strengthen our social relations, but in helping us to stave off a number of psychological and physiological problems as well. But more conceptually, oxytocin is proving to be a crucial ingredient to what makes us human,” (Dvorsky, 2012). When we increase our levels of oxytocin, we feel a sense of happiness and even ecstasy. Thus, shaking your body helps to ‘shake away’ the blues, assisting to aid with depression and anxiety. It is a way to bring forth your own sense of vitality in a natural and holistic manner. Kidding Around Yoga (KAY) helps to do this natural movement in a fun atmosphere. 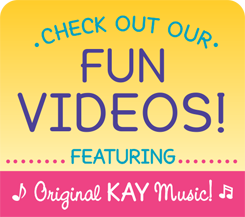 Through dancing, moving, yoga poses, and of course, shaking, KAY offers children (and big children) the opportunity to feel better throughout their mind and body, by doing fun, natural activities such as movement. KAY songs such as the ‘Yogi Shake’, ‘Every Little Cell’, and ‘Jogging Through the Jungle’, are just a few of a long list of songs that help with moving the body. Children are already apt to move, shake and soothe themselves. It is a natural tendency for children to participate in these activities. It is as we grow into patterns and expectations that we, as adults, begin to lose our natural tendencies and gain restrictions on our body and mind. These restrictions begin to expand and take over in our mental and physical capacities. One of the main goals of Yoga is moksha—liberation or freedom. Through the practice of yoga, we can disassemble our present boundaries and resurrect ourselves back into our natural tendencies, allowing for more freedom of mind and body. Using shaking as a means of healing is not new and it is quite universal. Sharon Gannon*, co-founder of the Jivamukti Yoga method, shares her experiences of witnessing shaking used as a healing method around the world; “I have been in a Masai village near Nairobi and witnessed Masai warriors jumping up and down until their smiles erupted into laughter, once again restoring their connection to the other animals and to the earth and sky. I lived on the Pacific Northwest coast with a Native American Shaker family who practiced shaking and trembling as a means to connect directly with God. I’ve been in Istanbul and seen Sufi dervishes whirl for hours in order to help them confront and lose their fear of death. Even so, all of those examples are tame and should be seen as refined, ritualized, religious experiences—bearing pale resemblance to some of the more wild shaking and trembling practices employed by ancient yogis and shamans who were looking for ways to experience, remember, and reconnect with that which is unpredictable and untamable—the wildness—that true spirituality which is forever blissful, ecstatic, free, naked, limitless, anarchistic, boundless joy—who we really are,” (2012). So as you grow further into your own practices and guide others as educator, motivator, yogi, and life changer, make sure you get people to shake. Shake out their bodies, shake out their minds. Encourage people to shake whenever and wherever they can. Guide them to shake off their inhibitions, tameness, depression, anxiety, boredom, predictability, and “normalcy.” Even after a short amount of shaking, you may experience at least a little bit of relief, and if nothing else you will at least experience some big smiles. It can help us to feel a bit better as we loosen up and let go of things we don’t need. It is in the idea of ‘shaking things off’ that we are able to start to let things go and the healing and soothing begin. We may begin to feel better and start to loosen up all aspects of the mind, body, and soul. When we shake, we begin to take a simple and natural form of medicine—movement and laughter. That is it… movement and laughter, which results in euphoria and smiles; a part of our body and soul that gets put away in the closet and not brought out enough to ‘wear.’ Let’s make a conscious effort to ‘wear’ our smiles every day. They do, after all, look absolutely amazing on all of us. Now go out there and SHAKE IT UP!!! Here is your daily dosage of medication… Shake, Smile, and Repeat as often as possible!!! In fact, back up from whatever form of technology you are reading this on, stand up, and begin to wildly shake your body and mind, just as if no one is watching! Now let your whole body SMILE, and finally Repeat!